During the long Australia Day weekend, I went to Venus Bay with my family and a family friend. Can you believe that a few weeks before "the big event" I go out and get sunburnt? No? Well surely these photos will paint a clear picture in your mind for you. I bet you can even feel the pain! Now, I wish I had taken photos of the day, but unfortunately I'm not the kind of person to take snaps every ten seconds. (Serena took some photos on her phone, maybe I'll bug her for them...) Once I'm somewhere, I just enjoy the moment without worrying about capturing it on film. So sadly, there will be no photos of the day so I won't talk about it. I'll just talk about my sunburnt back. I will mention that it was a very clear, hot day. Mid 30's, I believe. I caught 3 pipis. Go me! And I discovered a new hobby: body boarding! So fun! This is what happens when you think you're being clever and apply sunscreen all over your body, except the one place you can't really reach very well: your back! I didn't purposely leave my back unprotected, I had actually forgotten to apply sunscreen there each and every time I reapplied! How does one forget each time? I'm pretty sure my brain was reacting to the sudden surge of ultraviolet rays which it rarely ever experiences due to me being a homebody. Before I got to Venus Bay and stripped off, I had made sure to apply my sunscreen all over my body, including my back. 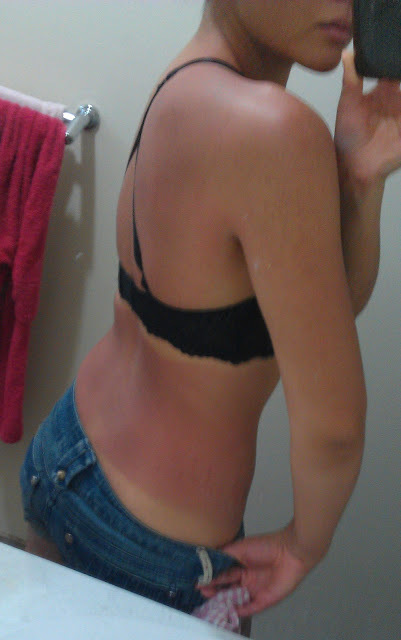 Once I got there and reapplied my sunscreen, I just completely forgot to do my back. I got an offer from someone to do my back, but I declined because I didn't think that he would do a good job. Ironically, I then forget to do it myself (was too busy talking about astrophysics and astronomy) so maybe I shouldn't have rebuffed him! Here's a photo I took of my younger son on the way back home. 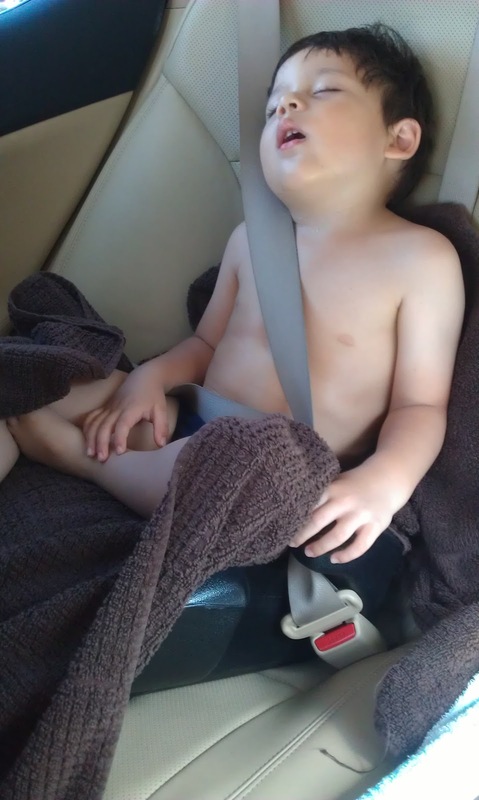 He's asleep in his speedos, lol! Australia day I was covered up, but I went to the beach on sunday which was boiling hot... :( Oh thank you, I will check your post out. Probably too late but it will be good for future reference! shock that females love to store and girls really like presents. the SD card will be impossible. I think you could find your favortie items among them. carry the device with them. bmp � R4 NDSI Bottom screen interface after starting the machine. Each device would occupy a USB port of your computer. In addition to its personal breitling replica jewelry brand Anil Arjandas, he is a super player and fashion watches fine. In Instagram upload their everyday watch with his greatest hobby, along with soy sauce, accompanied by appearance rolex replica of the watch and his Porsche sports car, Aston Martin sports car, Tom Ford suits, Cuban cigars and other luxury goods, pies plus not so Tyrant Popular fashion brands for him attracted 150,000 fans from around the world. Anil Arjandas although preference chanel replica Collection watches but also very loyal, Audemars Piguet Royal Oak can be said to be his favorite. In addition, he love Tom Ford menswear, love Goyard bags and Hermes bags! Tyrant say only have the strength to play a real cartier replica table, Anil Arjanda really deserved.